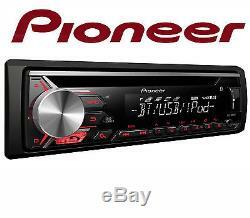 Pioneer DEH-3900BT Car Stereo with RDS tuner, Bluetooth, USB and Aux-In. Supports iPod/iPhone Direct Control, Android. You'll get the most out of your music collection with the DEH-3900BT. Tune into the FM radio, listen to a CD or connect your smartphone (and other music devices) via the front USB or Aux-in. On top, you can make hands free telephone calls in high detail, thanks to the external microphone supplied with the product. The stereo even allows you to connect up to two Bluetooth devices simultaneously! For those wanting extra Bluetooth features, you can also stream your favourite tracks wirelessly to enjoy crystal clear playback thanks to the Advanced Sound Retriever for Bluetooth. Enjoy pristine sound from the DEH-3900BT's built-in amplifiers that deliver 4 x 50W of pure, proven MOSFET power. If you want more power, you can use the 2 RCA pre-out to hook up a subwoofer or an extra amplifier for the rear speakers. Aux Input plug your portable music player directly into your device for an easy and convenient musical experience. Bluetooth maximise connectivity for hands-free calling and easy wireless audio streaming. Siri Eyes Free make use of your iPhone's Siri functionality through your unit's external microphone and the speakers of your vehicle. CD-R/RW enjoy stunningly accurate audio disc sound reproduction. USB Input connect any device with an USB interface cable to charge your device or listen to clean, clear sound. Advanced Remote Control App (ARC) Pioneers Advanced Remote Control (Pioneer ARC) app converts your compatible iPhone or Android smartphone into a powerful touchscreen remote control, which allows you to manage and customise the features of your compatible Pioneer car stereo system in an easy to use way. Works with iPod / iPhone With iPod and iPhone Direct Control, you can manage your i-device directly from your car dashboard and enjoy superior sound. MP3 and WMA audio files. AAC, MP3, WAV and WMA audio files. Other music devices via the front Aux-In. Remote Control: Steering Wheel Remote input. Protective Case for Front Panel. All the models in our Bluetooth range include an external microphone. Maximum power input: MOSFET 50W x 4. Advanced Remote Control App (ARC). USB Input: Front, iIlluminated USB. Android App control via USB. App playback (4.1 or later). Compatible Generations Compatible Android phones with Android V4.1 or higher. RCA Pre-Outs: 2 (Front, Rear or Subwoofer). Advanced Sound Retriever for Bluetooth. Graphic Equaliser: 5-Band Graphic Equaliser. Works with iPod / iPhone. IPod Direct Control allows you to control your Apple compatible device directly from your car dashboard. Compatible Generations Works with iPhone 5 or higher. 2 Phones Full Time Connection. Bluetooth Auto Pairing via USB. Display Illumination: Wide angle VA LCD Display (1 line with 13 characters). GET IN TOUCH WITH US. We are trending on Social Media. Follow us and stay updated. 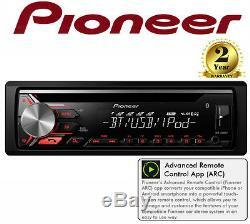 The item "Pioneer DEH-3900BT CD MP3 Bluetooth Car Stereo Headunit USB iPod iPhone Android" is in sale since Wednesday, October 05, 2016. This item is in the category "Vehicle Parts & Accessories\GPS, Audio & In-Car Technology\Car Stereos/Head Units". The seller is "dynamicsounds00" and is located in London.